It’s not the weather, since the past week stayed hot and humid. It’s not a return to school, since I work a full-time job and haven’t been in school for years. It must be some inner psychological link to the equinox, because we hit the official start of fall and I’ve been in a knitting frenzy ever since. Proof beyond the break. You may recall I posted this yarn in a yarn cake back on Wednesday. Late Thursday night, after swatching for a sock pattern, I cast on–finally!–for the Twist-Front Top (Ravelry link) by Adrienne Vittadini (scroll down; it’s the second photo). I’ve been wanting to make this top for years–evidenced by the fact that this is from the Spring 2005 booklet. I first saw it in one of those ads in the back of Interweave. And now I’m done with the back and about 1/3 of the way up the front. It’s a simple 4-row pattern repeat, and everything is chugging away quite easily so far. I’m eager to get to the miter shaping to see how it all comes together. I’m using the Brooks Farm Acero I got at Maryland Sheep and Wool, and it is much thinner than the yarn called for in the pattern, but I did some math and it seems that using the largest size in the pattern should yield a sweater that fits me. Plus some of the comments on Ravelry indicate that it stretches (it is lace, after all) and knitting a smaller size is recommended. Keep your fingers crossed. Yesterday was Spin-Out, and since I don’t spin, I showed up with this in tow and knit happily away for several hours with the crew from Sit ‘n’ Knit New York. The weather was perfect, perfect, perfect. There were lots of spinners who even dragged wheels to Central Park. It was the first time I’d ever seen spinning live. And . . . I still have no desire to learn. I want to finish this NOW! The back is blocking while I work on the front. 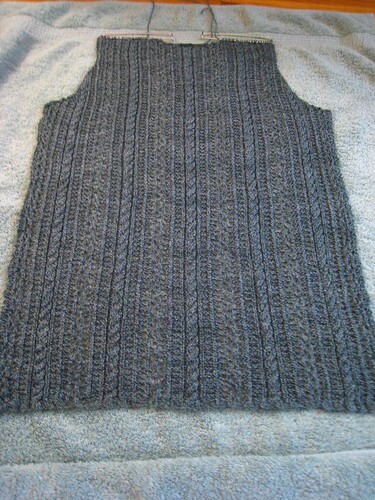 Happily, it seems that 2 skeins of this yarn should be the perfect amount for a tank top. Note, the color is most accurate in the outdoors shot. You are a speed demon! And I am with you on the spinning thing: zero interest! Aha, a completed back–partied in Brooklyn, or no? I’ll be scared to check your blog tomorrow lest you’ve finished the front…. Oooh la la, look at that speed knitting! I really admire Adrienne Vittadini designs. And the ones I’ve done or looked at have been very well written. I hope your top turns out to be just the right size. As you already know I absolutely love your pictures. Thanks for the tip and I’m heading to best buy during my lunch tomorrow to try and find that cute little doohickey. Yay! Glad you’re back. And how appropriate was it that I was knitting with my Acero (on a sock) while I read your post? 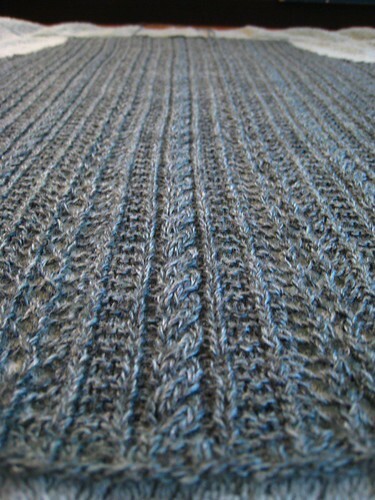 what a great stitch pattern! i love it! you’ll definitely have to keep us filled in on how far that yarn goes. i also have two skeins of the acero and don’t know what to use it for! We’re totally on the same wavelength, knitting-wise. Well, except we’re not knitting the same things. And you’re knitting much faster than I am. I guess what I mean is, I did a lot of knitting this weekend too! Totally love that top. You are going to look amazing in it. By the way, if you DO have a sweatshop of knitters, can I use them? wow, that was fast! it looks great blocking, and such nice details and perfect knitting. can’t wait to see the details in the front. Hi Minty, love your blog!! I am coming into NY this friday and am wondering if you have any suggestions on cool places to hangout (either knitting or non-knitting related). I am there for a week and last time I didn’t go to any yarn stores :(. Well, except one that was closing, so I don’t count that one. Anyways, would love to hear back from you!! The back looks great! And finished! It’s fabulous! Can’t wait to see the front (that twist detail is so interesting). It was great speaking with you on Saturday, and I hope that we can get together for lunch soon. It looks gorgeous, and you have so much done already – totally impressive. I’m sad I didn’t get to go to Spin out in the end, sounds as though it was goot times. The tank is looking great. Way to speed through that one! I am with you on Fall – I’m so glad it’s finally here. very pretty – love that blue…. wow – that is going to be beautiful. I really like the end product! I like the sweater. I can’t wait to see your’s finished up. I have added it my queue. I think I have that book too. Yowza! Here I was all pleased with myself for finishing a hat this weekend. I’m duly humbled and impressed. You are right about the whole equinox/knitting thing. There’s nothing like going into a knitting frenzy in the face of shorter days and cooler nights. Oh my gosh, it’s *beautiful*! Holy crap — you certainly hit the ground running! It’s looking beautiful. And I do love a well-placed Weezer reference (which is what that was, right?). Takes me back to sophomore year of college. Oh, the angst! Also, I was so inspired by your ninja-fast knitting skills that I tried continental for 3 whole rows of a Baby Surprise Jacket before getting cranky and giving up. Woohoo! Fall knititng. I’ve definitely gotten the bug too. Happy knitting. And I’m with ya on the whole no desire to spin thing. Though sitting in Central Park with your knitting watching other people spin does sound like a great way to spend a fall afternoon. I never got to ask what you were working on. Now I know! Very pretty. Look at you, jumping back in full force. Looking good.